I've been waiting for the adoption of BLE MIDI in products for a while. low the latency was and how reactive the interface was. bandwagon. Korg has their wireless controllers, Yamaha has their self-powered dongles, ect. I've been interested in using BLE MIDI myself for battery powered projects; I have too many ideas for 'wearable' MIDI controllers and cutting the wires would be great. It's the same size and same pinouts as the standard Arduinos, except this one uses Intel's latest and greatest SoC geared towards wearables, the Curie. 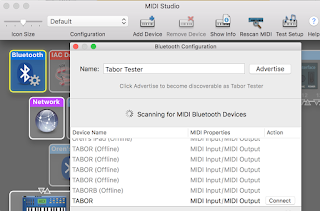 I based my characteristic ID and service ID on Apple's BLE MIDI document (https://developer.apple.com/bluetooth/Apple-Bluetooth-Low-Energy-MIDI-Specification.pdf) since MIDI.org has yet to release an official spec. With that said, I have only tested this out with my iPhone (6s), iPad (air 2), and Macbook Pro, and it works perfectly. As shown above, you can go to your settings in an app like Apple's Garageband, choose Bluetooth MIDI Devices, and then connect to your device. In the example my device is called Tabor. After connecting, you are off to the races with whatever MIDI data you want to send and receive. In a similar fashion, on OS X, you go to your Audio MIDI settings app and choose MIDI Studio. 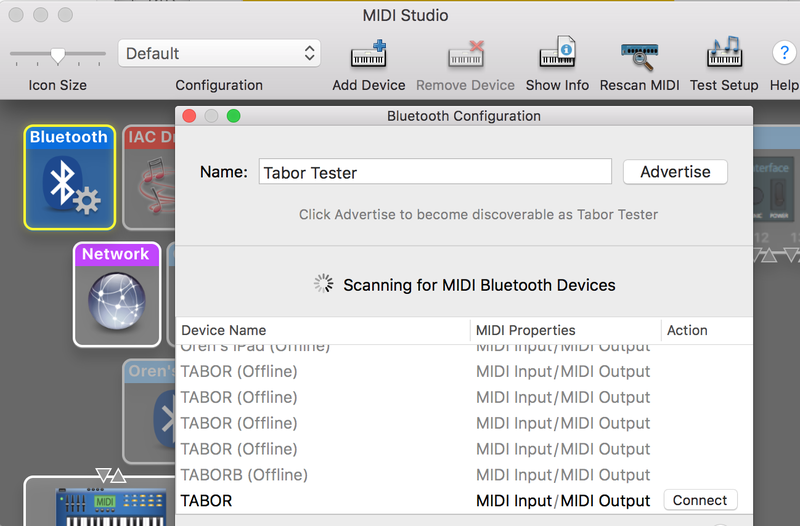 If you click on Bluetooth, you will see a window pop up looking for your advertising BLE MIDI compliant devices and give you a chance to connect to them. When using OS X, once connected, your device shows up just like any other MIDI device on OS X, so your use is very flexible. Initially, I put up code for a bare minimum MIDI Sending device. I will be adding code for MIDI receiving and both together, along with some simple instruments you can implement with the Arduino 101. Update: added Airpeggiator instrument example. Update: Fixed code to work with Arduino 1.6.9. Added licensing and more comments to Airpreggiator.